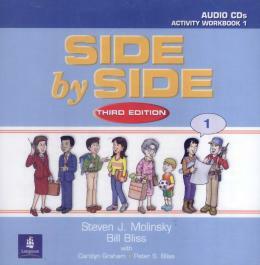 Side by Side Third Edition is a new and improved edition of this dynamic program that integrates all skills in a light-hearted, fun and easy-to-use format that has been embraced by teachers and students worldwide. A vocabulary Preview section ineveryunit introduces keywords in lively picture dictionary. How to say it! Lessons highlight communication strategies such as complimenting, hesitating, and apologizing. Pronunciation exercises provide models for practicing authentic.unciation, stress and intonation. *All new illustrations are lively, light-hearted, and richly detailed to offer students language practice that is contextualized and fun.